On May 4 President Obama announced that the government would not release pictures of the late Osama bin Laden, former leader of the terrorist group Al Qaeda, taken post-mortem. The president has stated that it is in the interest of national security, but since the announcement, individuals have challenged the president’s decision, claiming that the photos would prove bin Laden’s death and bring further relief and reassurance for Americans. Despite this response, several members of the Elon community support the president’s decision, stating that national security should be a priority. According to the government, the photos are incredibly gruesome and would only serve to incite violence worldwide. Phil Smith, associate chaplain and director of religious life at Elon, said that on a campus such as Elon, the reaction to the release would be different than what was experienced after the announcement of bin Laden’s death. “I don’t think you would see riots like that on our campus,” he said. The United States has been searching for the Al Qaeda leaders since 2001 following the Sept. 11 attacks in which four planes were hijacked and crashed into three national landmarks. 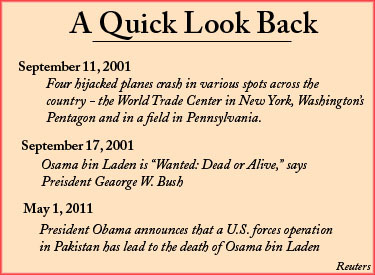 In the days following President Obama’s announcement of bin Laden’s death on May 1, many individuals impacted by the 2001 attacks have said they feel a sense of relief. For others, seeing photos would mean more. According to an NBC News poll, two-thirds of Americans agree with Demo, stating that they support the decision to keep the photos under wraps. However, 24 percent surveyed said they strongly disagree, some stating that proof would bring about a complete sense of closure. Elon senior Priscilla Abad says she would like to see photographs. “People seem to believe with their eyes and not with their ears. I kind of would like to at least have them available for viewing,” she said. In the days following the announcement of bin Laden’s death fake photos circulated the Internet, increasing the desire to have official photographs released. However, Zarzar says he believes that others are concerned with the methods the United States used. “Many people have raised the issue that this was clearly a violation of national law,” he said. “It looked like execution style” based on the statements the government has released about what took palce in Pakistan. “We could have done it in a way that was more consistent with our values, how we do things in this country, but Osama bin Laden is Osama bin Laden. People can’t forget what he did,” Zarzar said. Elon senior Christopher Spalding said he thinks that, although releasing pictures is not the right thing to do, it does raise some issues. “It does cause a little bit of speculation – is he really dead? Is he not dead? Is the U.S. just trying to assume other people are going to believe it and just not question it? Maybe, but at the same time you heard it from the president of the United States, and you’re hoping it’s true,” he said. According to Zarzar, the decision not to release the photos also keeps individuals from viewing the U.S. as bragging. “When you reveal pictures like that it seems to send the wrong message like we’re gloating, and we don’t want to appear to show something like that where we appear to be gloating, bragging about something like that,” he said. Your graphic has a typo – you used 2011 for the Bush statement instead of 2001. Great quote from Abad. I would like to see a photo of her. I hope you have one. It is hard to find the contrary point of view when only 24 percent of American’s have that sentiment. The Spalding quote is good, too. It was nice of Zarzar to do this for the class. You should all send him a thank-you card! Great closing quote from Zarzar, by the way! Caption over the Phil Smith video does not have Smith capitalized. Just noticed.